The Lord of the Rings: The Return of the King (2003) - AoM: Movies et al. The best of the three movies. I have yet to read Tolkien's The Lord of the Rings. In preparation for this viewing of The Return of the King, I read up on what part Bret McKenzie plays. 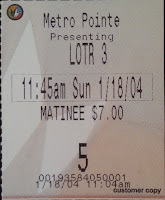 On a different note, I didn't remember any of the extended scenes, so I believe this was my first time watching the extended version of the movie. I definitely enjoyed watching the scenes with Shelob on the big screen. Many other action packed scenes were also good. With that being said, I actually didn't enjoy some of the scenes; maybe I was influenced by some of my friend Josh's opinion of the extended version. His opinion is that the original movies get better with each movie, while the extended movies get worse. The remainder of this day's entry (20110628) is a mild rant of the excessive clapping that took place during the movie. 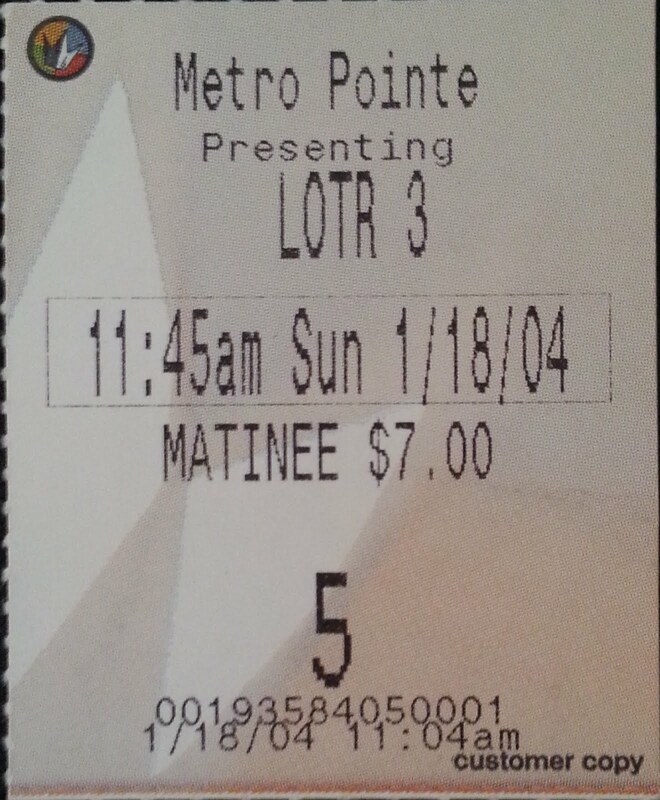 During this viewing we sat right behind a row of people who clapped during many of the scenes throughout the movie. This was more annoying than the group of viewers who clapped during the entire credits of the second movie, which was only somewhat disappointing because I enjoy listening to the music. Returning to this viewing, the group in front of us literally clapped for every scene that was clap-worthy - mildly annoying. They also clapped at some scenes which weren't clap-worthy - extremely annoying. In fact, I could hear one particular person from their group, perhaps the leader of the clappers, give these single weak claps to try and get his group clapping; what a jerk. In fact, I got so riled up, I was preparing to throw popcorn at him or shout out "That scene isn't even worth clapping for!" I resisted. During the credits, only the leader clapped. The woman to my right, who occasionally joined in on some of the claps during the movie, had a change of heart and told the leader to stop clapping. He tried to defend himself and retorted that was his way of showing he enjoyed the movie. She was quick to tell him she doubted his clapping had such intentions. I don't mind if a scene is worth clapping for, but the clapping during this viewing was excessive and I was annoyed by it. I would be more inclined to openly voice my opinion in the future. A friend of mine mentioned such moments are more likely to occur during a reshowing. On an unrelated note, I had a great soda combination (Coca-Cola Freestyle): about 90% Coca-Cola Lime and 10% Peach Fanta. It was excellent. Watched many other times on DVD. This is one of my favorite HISHE (How It Should Have Ended) videos. "Could you imagined what'd it be like if we walked all the way?" Hahahahaha.